You have heard our manta before: schools from kindergardens to college, should be places that invite people in. 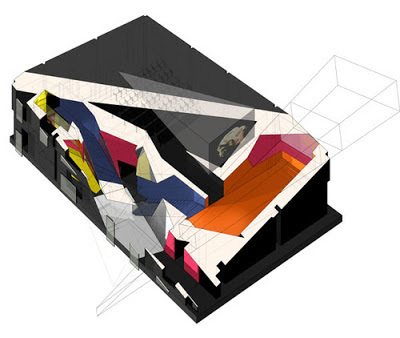 Educational institutions need to be exciting environments that are well designed. Good design as well as color application sparks learning. When students, kids or adults, want to be at school their minds are better primed for achievement. Depending upon the age of the students the amount of color and stimulus that is appropriate is proportionate to their maturity. Many colleges these days are taking this idea to heart. Colleges, much like tech firms, have found themselves in a very competitive market. Students have a lot of choice when it comes to where to apply and where to spend their education dollars. Colleges are turning to designers and architects to wake up their campuses and attract students to their institution. Two colorful colleges Birkbeck, University of London and Da Vinci College in South Holland demonstrate the concept. Several factors are working in their favor, mature students are comfortable in more colorful environments and European design has long been more adventurous in their application of color . 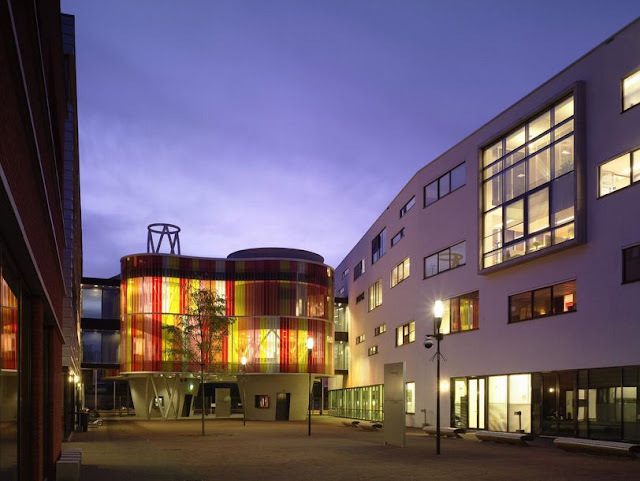 A few years back Birkbeck benefited when England's government approved funding for new buildings on campuses around the country in an effort to modernize schools and keep students engaged. Surface Architects won the competition held for the school with this bold mix of high gloss, matte, and sharp misleading angles. 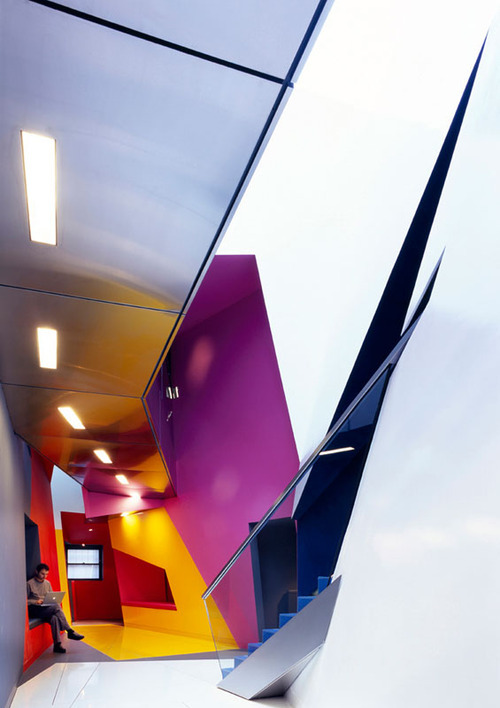 This dense mix of colors quiets as students enter each individual classroom but the common areas, the hallways, with full padded window benches for studying, encourage lively interaction between students. 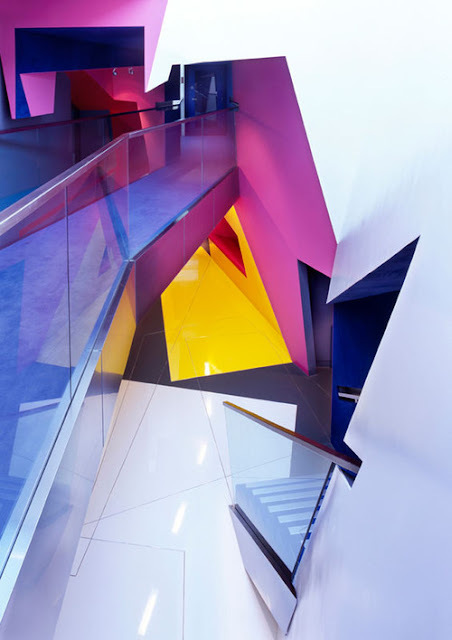 The colors dare you to be bold with your ideas just to compete with the walls themselves. 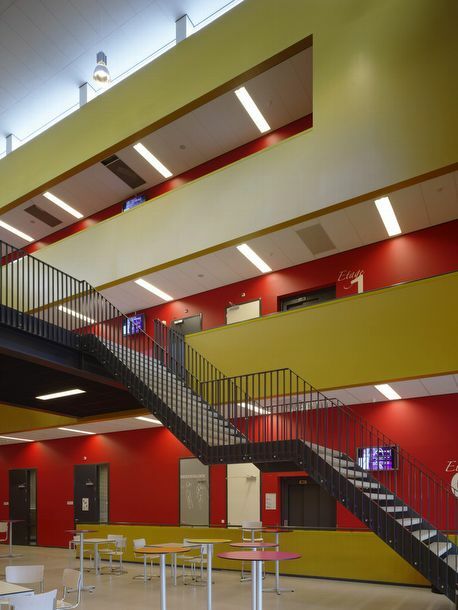 Da Vinci College, a smaller regional college located in the south of Holland also uses color and architecture to welcome students. But not all uses of color in school work. This school populated by younger students with vocational aims uses red and yellow to both great and deleterious effect. 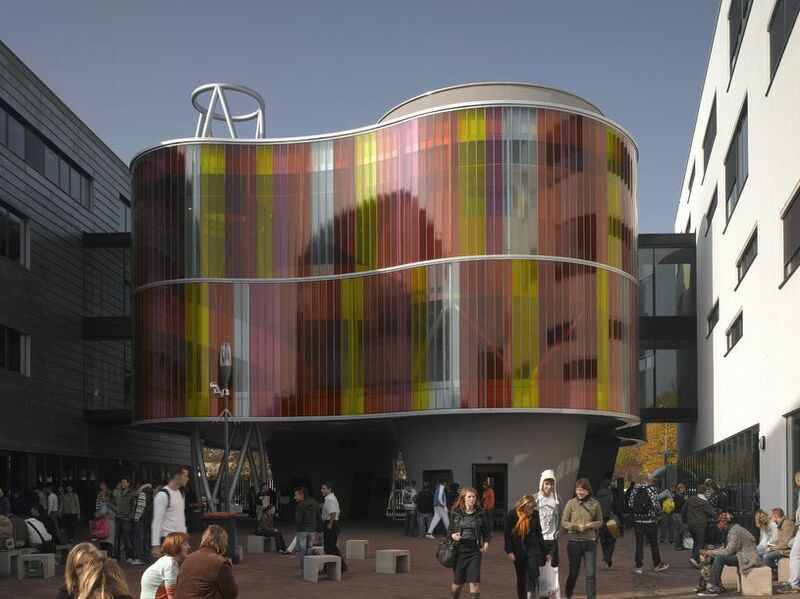 The prominent red and yellow glass of the schools is softly colorful during the day and glows like a striped candy at night. 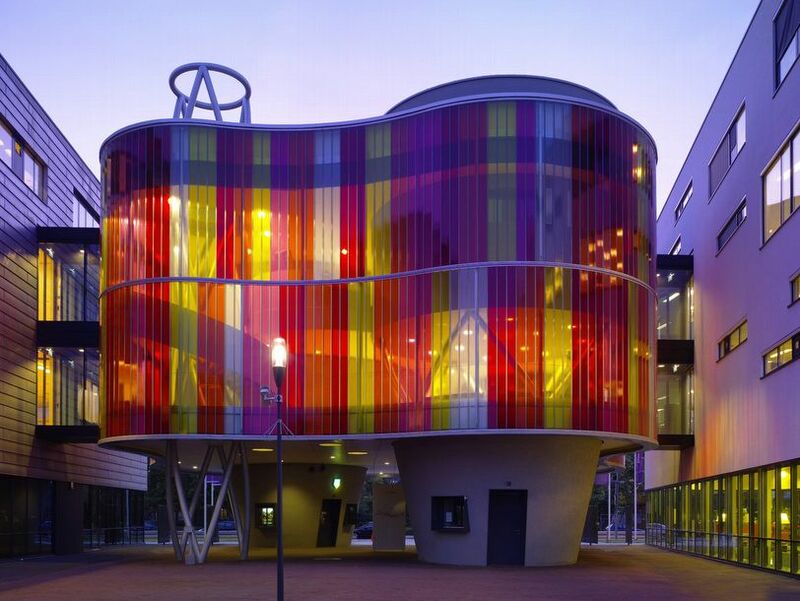 The curving walls, vertical stripes and unpatterned colors give this building a warm bees-to-flowers feeling and the color choices work well. That is until you go inside. When the color scheme goes indoors the warm glow persists but the colors and the way they are positioned on the recessed walls some how maintains a kind of brutalist institutionalism. While surely better than an all white paint job, this layout does little to help the space. Instead of , like the Birkbeck building, where the common spaces encourage the mixing of ideas with well thought out color placement, this red and yellow arrangement seems entirely arbitrary and perhaps even chosen solely for ease of application. 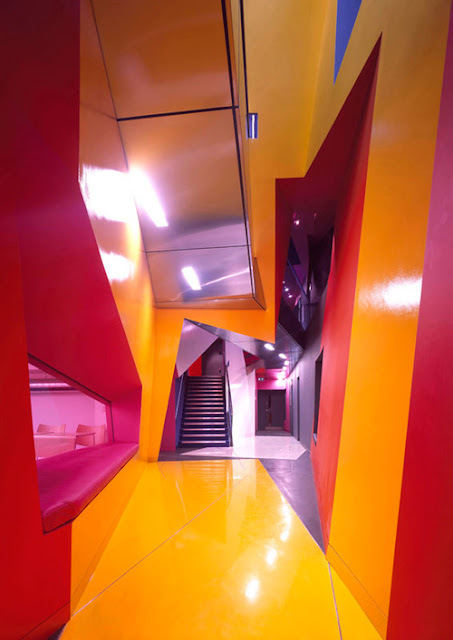 When color is applied though the building without differentiation between active public spaces and internal quieter classroom situations the color itself works against the functionality and comfort of the end users.